It seems Ford has taken to heart the concerns over the difference in its new hybrids between EPA gas-mileage ratings and real-world results. 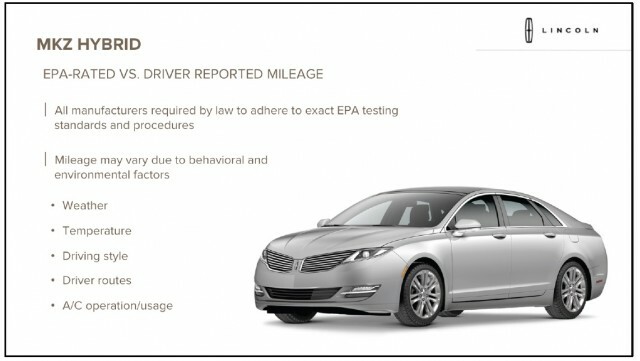 In a media presentation yesterday on the new 2013 Lincoln MKZ Hybrid, Ford's luxury brand devoted considerable time to explaining how it helps drivers understand the factors that affect their real-world fuel efficiency. In fact, out of 43 slides covering every aspect of the new hybrid, fully nine addressed the information provided by the MKZ Hybrid to drivers on efficiency. Several of the information displays that appear on the screens either side of the central speedometer are very similar to those used in the Ford Fusion Hybrid (whose understructure the new Lincoln shares) as well as the Ford C-Max Hybrid. 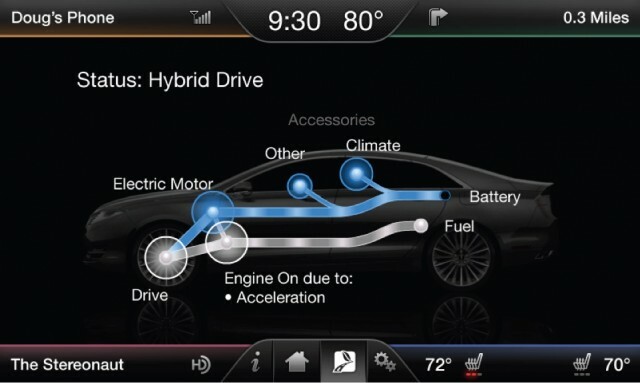 But Lincoln has redesigned the energy-flow diagram that's shown on the large center-stack display. It now uses colored arrows to show power flows among the engine, electric motor-generators, and lithium-ion battery pack. And that energy flow now includes arrows that show both "Climate" (largely meaning the air conditioning, if it's on) and "Other" cabin electrical draws. That underscores the message that use of the climate control has a noticeable impact on the amount of energy being consumed by the car at any given point. A short stint behind the wheel with the climate control turned off (baking in the car's black leather interior) showed that, indeed, the MKZ Hybrid appeared to offer more acceleration and longer duration on battery power alone than it did with the AC switched on. That same display also now shows a reason every time the engine switches on. Those include "Acceleration" as shown below, along with "High Speed"--which on our short Manhattan test drives seemed to kick in at 35 mph or so (with, admittedly, the air conditioning turned on). 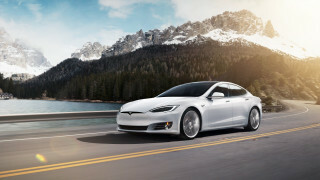 The 2013 MKZ and MKZ Hybrid mid-size sedans compete most directly with the Lexus ES 350 and ES 300h hybrid, Lincoln says. While the MKZ Hybrid's fuel efficiency is EPA-rated at 45 mpg, previous experience with its sibling the 2013 Ford Fusion Hybrid indicates that it may likely return somewhere between 35 and 42 mpg in real-world use. We won't know for sure until we test it over several days. Meanwhile, at least it appears Ford has heard buyers' concerns over the disparity between EPA-rated and real-world gas mileage. How will all this information be passed along to MKZ Hybrid buyers? Well, that's up to the salespeople and delivery staff at the dealership. The revamped "Lincoln Motor Company" is stressing that the dealer experience, tone, and hospitality will be entirely different when shopping for a Lincoln. So we'd be curious to hear from anyone who's bought a 2013 Lincoln MKZ Hybrid: How much explanation did you actually get from your dealer about factors that affect gas mileage?